Dutch sculptor Wilhelmus M. (Pim) van Moorsel (b 1932) has created a sculpture that he called Tommy Ladnier Blues. 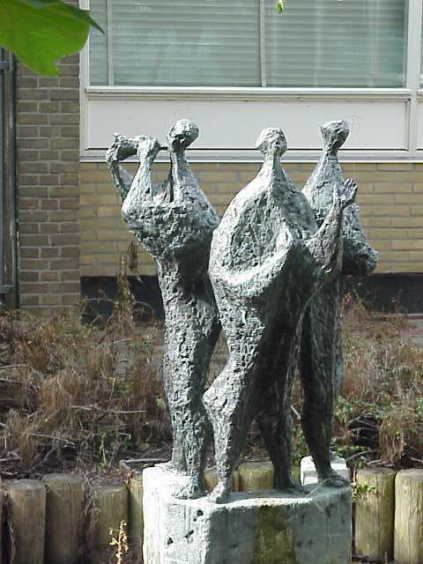 This sculpture was unveiled at Rozenburg, Rotterdam in 1968. Some day in April 1968 I read about the unveiling of a statue showing Tommy Ladnier. I read it in the morning while I was at work. I called town hall Rozenburg (somewhere below Rotterdam) and I found out that the statue to be unveiled was at a schoolyard. So immediately I took the day off, because the unveiling was due that afternoon. […]The statue was covered with a few carton boxes (yes, it’s that small indeed – something like 1.00 meter high, or 1.60 with pedestal). That gramophone played ‘Oh play that thing’, and the statue was revealed…. showing Tommy himself, Ma Rainey and Johnny St.Cyr. The school at Maasstraat 2, Rozenburg, is today demolished and the Tommy Ladnier Blues statue is stored in the building at Frans Halsstraat 2, Rozenburg. The statue is made of bronze, 77 cm high and placed on a pedestal that is 57 cm high. Hans Esman also thinks that he has heard about another statue in Holland. Thanks to Hans Esman and Annelies Knol, Communication employee, Rozenburg.